The Wingman-and-Peacekeeper combo is quickly taking over Apex Legends, and with good reason—it owns. The combination is also having an unexpected consequence on me: I found myself actually invested in a video game’s meta. 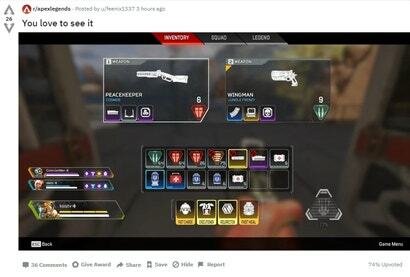 The Wingman is a pistol that can kill a player in three headshots, and the Peacekeeper has the potential to deliver 110 damage via body shots if all the pellets land. In the hands of a skilled first-person-shooter player, this combo can be unstoppable. In my unskilled hands, they bridge a skill gap and challenge me to play more effectively. 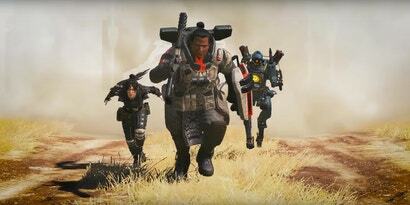 I’m not usually one to care much about guns in a game, but Apex Legends is changing my perspective a bit. In my quest to become a better player, finding a Wingman and a Peacekeeper on the map always feels like an opportunity. They’re the weapons that have granted me my measly handful of kills, but more than that, I know that if I get more practice using these guns, I can learn to be a great player. They’re not wrong. I usually get killed by a few Peacekeeper body shots or a well-timed Wingman headshot. But I’m learning something fromthe community’s mass consensus that this is the best loadout in the game. Watching a new game form its meta in only a few weeks has been fascinating to me as an outsider looking in, like in the case of Overwatch. Every time I have a Wingman and a Peacekeeper, I feel like a smarter player for knowing what the best guns are. It doesn’t mean I actually play better, though. That will just come with time. Should be noted that this is the best loadout on console, with auto aim helping the wingman tremendously. On PC, the Wingman is far less dominant. Is this a joke? As a primarily PC gamer I am finding aiming in game hard to master on the ps4 pad unlike games that do have aim assist like GTA and RDR etc.
? - I can't remember the last console shooter that didn't have auto aim. 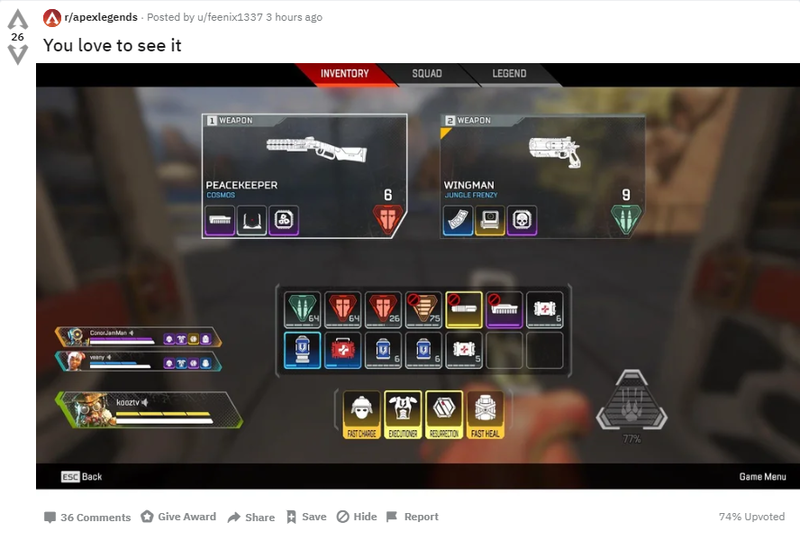 Well the reddit seems to think that this is one of the few games that is assist free on consoles and based on my experience I also can't believe it has auto aim or i'd be able to get more kills. Still I could be wrong. A quick google isnt really clear either way. If it has AA, its far more subtle than other games that have it, so that could be something giving a false negative. Few comments from someone in the know. To me, that reads that somethings there, just not as much as other shooters. Ah the meta I always find metas are horrible and game destroying. Really rips the fun out of games.